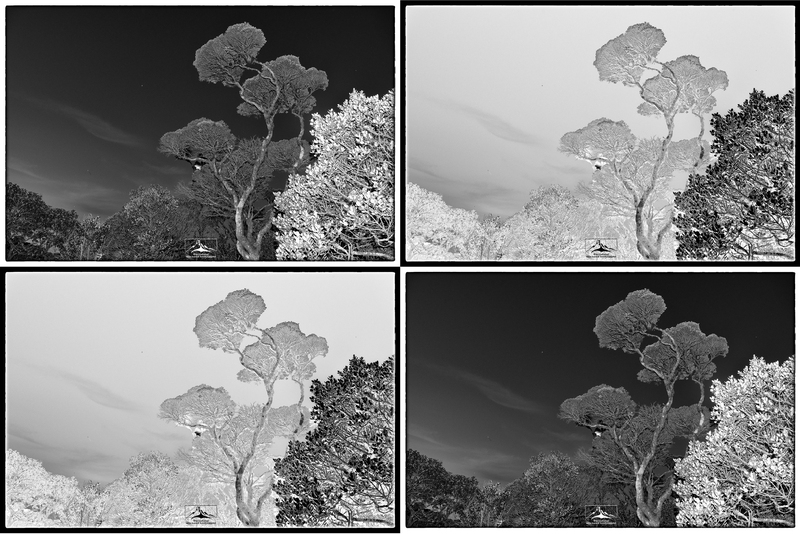 Horton Plains cloud forest canopy study in black & white. In the third week of January every year I have the opportunity and privilege of being involved in some rather cool teaching and learning in our home of Sri Lanka. The Experience Sri Lanka! Week Without Walls program gives OSC teachers the opportunity to share our passion for adventure, discovery and learning beyond the barriers of our classrooms. This year I once again led a group of students and teachers in and around the Central Highlands while exploring themes of landscape an ecology through an interdisciplinary unit involving visual arts and science (ecology). Sri Lanka White Eye (Zosterops ceylonensis) at Victoria Park in Nuwara Eliya. Giant Grizzled Squirrel (Ratufa macroura) near to Belihuloya. Pied thrush (Geokichla wardii) at Victoria Park in Nuwara Eliya. Spot Winged Thrush (Geokichia spiloptera) at Horton Plains National Park. Fulfill the OSC mission statement of developing the whole person within a safe environment. Expose students to our host country Sri Lanka’s culture and environment. Enable opportunities for service learning and outdoor education. Use Interdisciplinary Units (IDUs) to support and strengthen existing secondary curriculum (including the DP CAS program) for the benefit of student learning. The five-day excursion into Sri Lanka’s high elevation interior exemplified some of the best outcomes of field-based learning. The learning focus was on using photo documentation to better understand the ecology and landscape of Sri Lanka’s mountainous interior. All of the students had some sort of DSLR or point and shoot camera where they could learn basic controls and composition as we had different encounters. This year we had 13 students and three of us adults to guide them. I was supported by Loretta Duncan and Desline Attanayake who both played key roles in organization and participating in all of our activities. We also had two drivers from Yamuna Travels who got us to our different destinations safely. The students were enthusiastic and cooperative as we took on new challenges every day. Accommodation for the first three nights was on the cozy-rustic side of things, but on the last night the group was treated to very comfortable rooms in Nuwara Eliya’s St. Andrew’s Jetwing hotel. (Pseudophilautus microtympanum) at Horton Plains National Park. (Pseudophilautus microtympanum) at St. Andrews/Pidurutalagala. (Pseudophilautus schmarda) at St. Andrews/Pidurutalagala. Montane Hour Class Fog (Taruga eques) at St. Andrews/Pidurutalagala. We experienced consistently clear, beautiful weather with classic, crisp winter conditions. There had been frost earlier in the month but by the time that we got to the high reaches of the dormitory neat Mahaeliya bungalow in Horton Plains it was at least 10-15 degrees C° above freezing. The highlight of the time in Horton Plains was climbing the 2nd and 3rd highest mountains in Sri Lanka. Kirigalpotta (2,388 m) was the focus of a seven-hour round trip hike on Wednesday and Totupola Kanda (2,360m) was a short walk that we did on Thursday morning. For good measure we visited Sri Lanka’s highest peak Pidurutalagala (albeit by van, as walking is not allowed) on the final morning of the experience. On all of these morning we were blessed with exquisitely clear conditions that allowed for crystal clear views to Sri Pada and the neigboring ridges. Early morning view to Sri Pada from the slopes of Thotupola. Kirigalpotta adn Horton Plains from Thotupola Kanda. Critical Ecosystem Partnership Fund (CEPF). Western Ghats and Sri Lanka Biodiversity Hotspot. May 2007. Web. De Silva, Anslem and Kanisha Ukuwela. A Naturalist’s Guide to the Reptiles of Sri Lanka. Colombo: Vijitha Yapa Publications, 2017. Print. De Silva, Anslem. The Diversity of Horton Plains National Park. Colombo: Vijitha Yapa Publications, 2007. Print. Pethiyagoda, Rohan. Horton Plains: Sri Lanka’s Cloud Forest National Park. Colombo: WHT, 2013. Print. Rodrigo, Malaka. “Lanka’s central highlands win heritage battle”. The Sunday Times. 8 August 2010. Web. Senevirathna, Ishanda. The Peeping Frogs of Nuwara Eliya. Colombo: Jetwings, 2018. Print. Somaweera, Ruchira & Nilusha. Lizards of Sri Lanka: A Colour Guide With Field Keys. Frankfurt: Edition Chimaira 2009. Print. Werner, Wolfgang. Sri Lanka’s Magnificent Cloud Forests. Colombo: Wildlife Heritage Trust, 2001. Print. 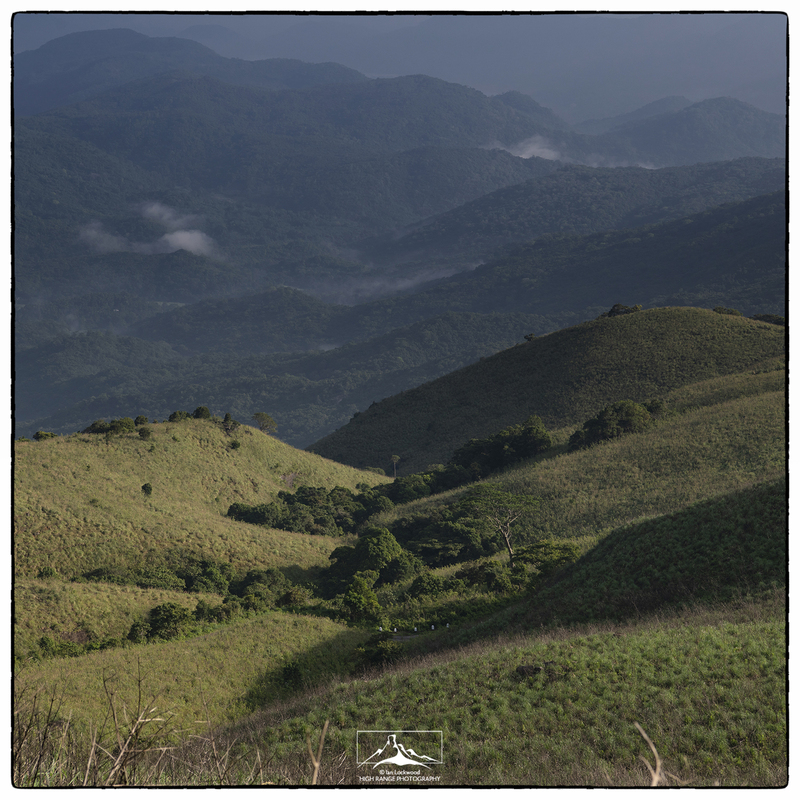 The Knuckles or Dumbara Kanduvetiya mountain range is a vital refuge for Sri Lankan biodiversity. Cloaked in mist, both literally and figuratively, they sit at the center of the island but are one of the least-understood natural landscapes in Sri Lanka. In 2010 UNESCO recognized the Knuckles conservation area as part of the Sri Lankan Central Highlands World Heritage Site (UNESCO). That helped draw positive attention to the area. Located north-east of Kandy, the range is spread over about 210 square kilometers and includes a collection of rugged peaks just under 2,000 meters. I’ve been interested in the Knuckles for some time, especially since there is a strong ecological and geological affinity with the Southern Western Ghats. Last term’s school break and a family road trip gave me a chance to continue my explorations that first started in 2005. It is difficult to move through the Knuckles area, a landscape dominated by steep escarpments, craggy peaks and isolated valleys. Dense forest makes movement difficult. I have thus far visited the two different corners on four separate family trips and I feel like we are just starting to scratch the surface of getting to know the area. When we first arrived in Sri Lanka in 2005 our family took two short visits to the Corbet’s Gap side of the Knuckles range. Now, in the last two years, we have been to the Riverston area twice. I was particularly interested to observe and document parallels in the landscape and ecology of the Knuckles with the southernmost Western Ghats. I had heard anecdotal reports that the Agasthyamalai range, one of the richest biological zones in the Western Ghats, shares affinity with the Knuckles area. Thus, I was interested to see the pantanas and see to what extent they mirrored patterns of mid-elevation grasslands in the southern Western Ghats. These links continue to drive my ongoing interest in the Knuckles. The Knuckles or Dumbara range, as seen from the summit of Sri Pada on a crisp December morning in 2013. There are several species of reptiles and amphibians that are closely associated with the Knuckles area and are, in fact, endemic to the range. The Leaf Nosed Lizard (Ceratophora tennentii) and Knuckles Pygmy Lizard (Caphotis dumbara) were on my list and with advice from Nadeera we found several individuals on the Riverston pass. In the coming months we plan to return to learn more about this fascinating corner of Sri Lanka. Crestless lizard juvenile (Calotes liocephalus) at Riverston. Shades of the shola/grasslands mosaic? These are mid-elevation pantanas (@700-1200 m) with coarse grasses on the Riverston road. Morning view looking north from the Riverston road. The foreground is dominated by the pantanas- native grasslands at a mid-elevation (@700-1200 m) with coarse grasses. Exploring the road to Riverston tower with Mangala Karunaratne and his kids Matesha and Sandamali. Lenny on the far left and Amy on the lower boulder. Lenny with friends at a tea garden on the way to Corbet’s Gap. April 2007. Lenny with our snake stick on the April 2007 visit to Corbet’s Gap. The broad sweep of the Knuckles range seen from the border of Wasguma National Park looking due south. October 2016. Bambaradeniya Channa and S P Ekanayake. A Guide to the Biodiversity of the Knuckles Forest Range. Colombo: IUCN. 2003. Print. De Silva, Anslem. 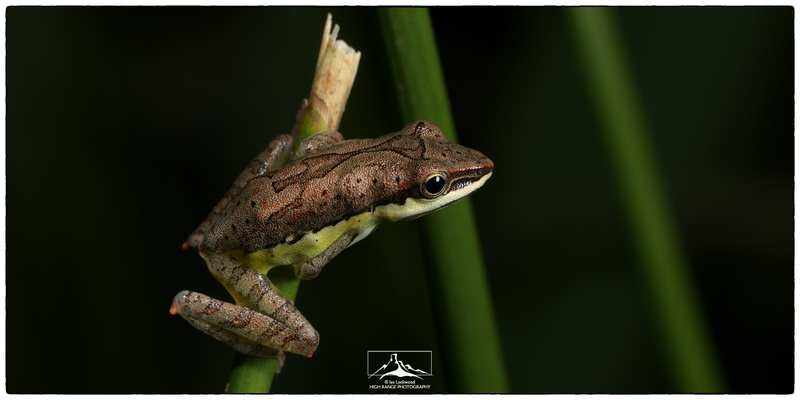 Amphibians of Sri Lanka: A Photographic Guide to Common Frogs, Toad Caecilians. Published by author, 2009. Print. De Silva, Anslem, Ed. The Diversity of the Dumbara Mountains. (Lyriocephalus Special Issue). November 2005. Amphibia and Reptile Research Organization of Sri Lanka. Print. De Silva, Anslem and Kanishka Ukuwela. A Naturalist’s Guide to the Reptiles of Sri Lanka. Colombo: Vijitha Yapa Publishing, 2017. Print. Ekanayake, Sarath and Channa Bambaradeniya. Trekking in the Knuckles Forest: A Trekking Guide to Alugallena, Dekinda and Nitre Cave Nature Trails. Colombo: IUCN. 2003. Print. Lakdasun Trips. “Knuckles.” ND. Web. Lindström, Sara. Eskil Mattsson and S.P.Nissanka. 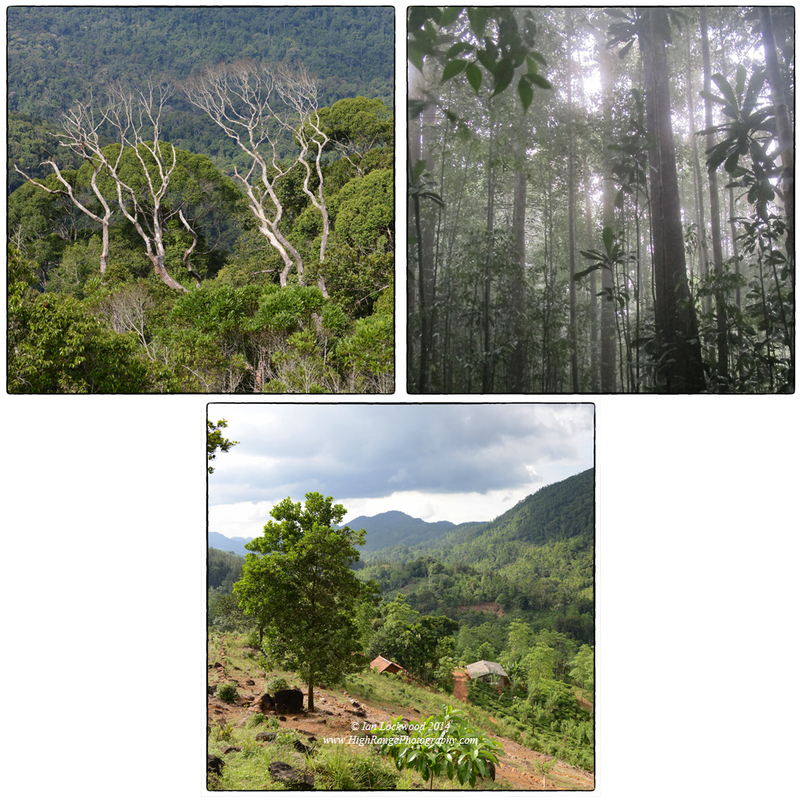 “Forest cover change in Sri Lanka: The role of small scale farmers.” Applied Geography. May 2012. Web. Meegaskumbura, Madhava et al. “Amphibian Research in Sri Lanka.” Froglog. (via ResearchGate). January 2014. Web. Somaweera, Ruchira and Nilusha Somaweera. Lizards of Sri Lanka. A Colour Guide with Field Keys. Frankfurt: Edition Chimaira, 2009. Print. Weerawardhena, Senarathge R. and Anthony P. Russell. 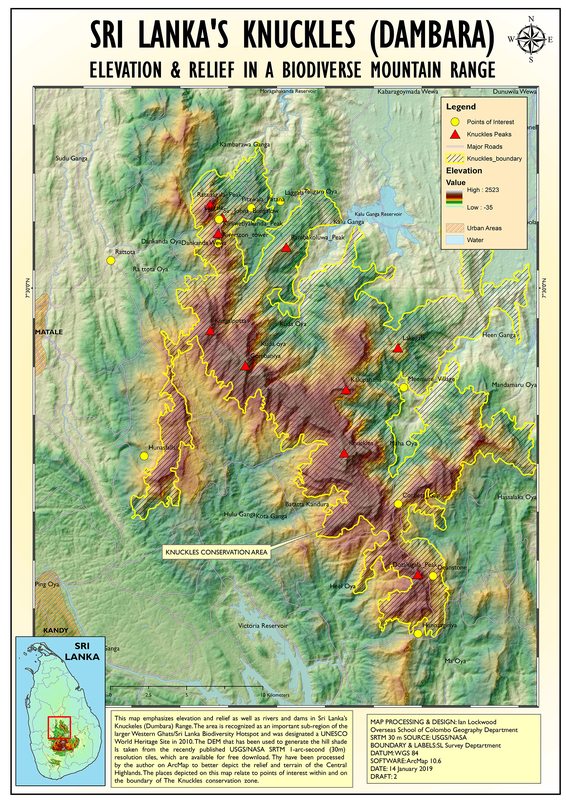 “Historical land-use patterns in relation to conservation strategies for the Riverstone area, the Knuckles massif, Sri Lanka: insights gained from the recovery of anuran communities.” Taprobanica. October 2012. Web. The five-day excursion into Sri Lanka’s high elevation interior exemplified some of the best outcomes of field-based learning beyond the normal confines of a classroom. The learning focus was on using photo documentation to better understand the ecology and landscape of Sri Lanka’s mountainous interior. This year we had a smaller sized group-10 students and three of us adults to guide them. I was supported by Kamila Sahideen and Desline Attanayake who both played key roles in organization and participating in all of our activities. We also had two veteran drivers from Yamuna Travels who got us to our different destinations safely. The students were enthusiastic and cooperative as we took on new challenges every day. Accommodation for the first three nights was on the cozy-rustic side of things, but on the last night the group was treated to very comfortable rooms in Nuwara Eliya’s St. Andrew’s Jetwing hotel. Sri Pada (Adam’s Peak) under the profile of a cloud forest sentinel on the lower slopes of Pidurutalagala. Sanjana and the curious telphone box at Mahaeliya. 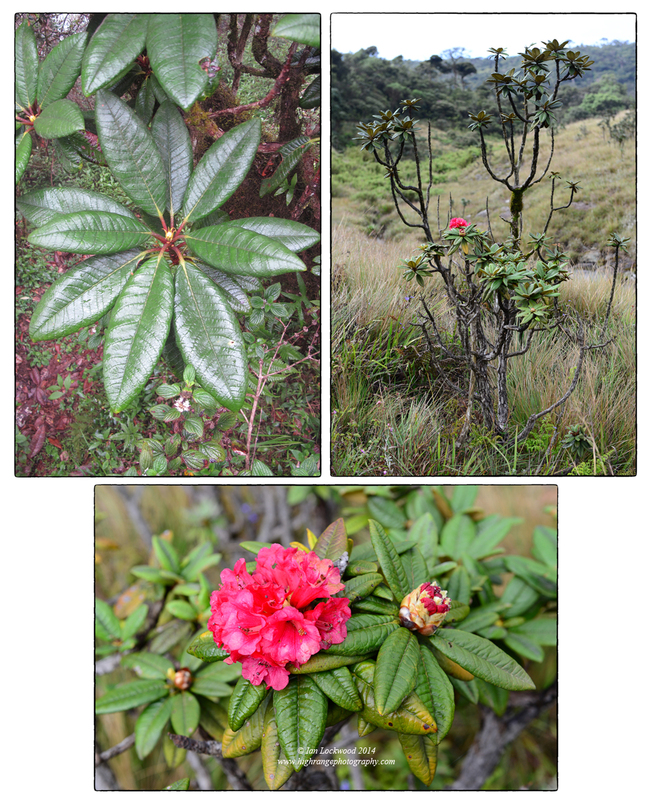 Hiking by Rhododendron trees on the patana-cloud forest boundary along the path to Kirigalpotta. The five-day excursion into Sri Lanka’s high elevation interior exemplified some of the best outcomes of field-based learning. The learning focus was on using photo documentation to better understand the ecology and landscape of Sri Lanka’s mountainous interior. All of the students had some sort of DSLR or point and shoot camera where they could learn basic controls and composition as we had different encounters. This year we had a smaller sized group-10 students and three of us adults to guide them. I was supported by Kamila Sahideen and Desline Attanayake who both played key roles in organization and participating in all of our activities. We also had two veteran drivers from Yamuna Travels who got us to our different destinations safely. The students were enthusiastic and cooperative as we took on new challenges every day. Accommodation for the first three nights was on the cozy-rustic side of things, but on the last night the group was treated to very comfortable rooms in Nuwara Eliya’s St. Andrew’s Jetwing hotel. Weather in the Central Highlands is always hard to predict but this year we were blessed with classic, crisp winter conditions. There had been frost earlier in the month but by the time that we got to the high reaches of Mahaeliya bungalow in Horton Plains it was at least 10-15 degrees C° above freezing. The highlight of the time in Horton Plains was climbing the 2nd and 3rd highest mountains in Sri Lanka. Kirigalpotta (2,388 m) was the focus of a seven-hour round trip hike on Wednesday and Totupola Kanda (2,360m) was a short walk that we did on Thursday morning. For good measure we visited Sri Lanka’s highest peak Pidurutalagala (albeit by van, as walking is not allowed) on the final morning of the experience. Grasshopper (Orthoptera sp.?) love fest near Lanka Ella Falls on Day 2 of the Highlands experience. Rhino Horned Lizard (Ceratophora_stoddartii) at Horton Plains National Park on Day 3, views from the same image file. Encounters with biodiversity were integral to the Highlands experience. On the first day as we hiked along the Belihuloya stream we had sighting of several eagles (Black, Crested Hawk and Serpent). 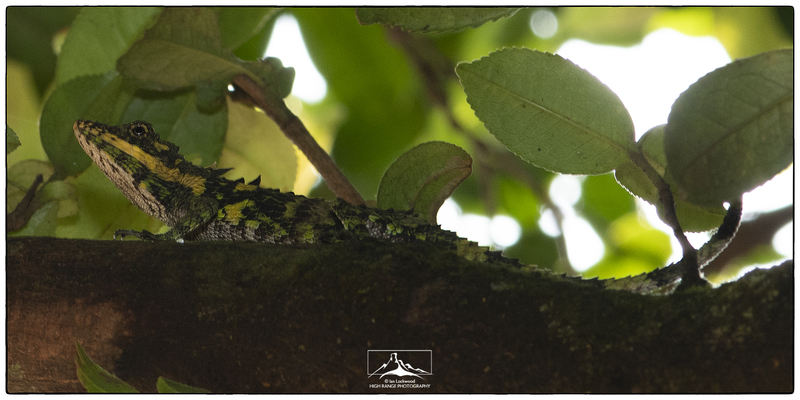 In Horton Plains we appreciated cloud forest flora and endemic lizards (Rhino horned and). On our final afternoon we visited Victoria Park to observe Pied Thrushes and other rare birds. That evening before dinner Ishanda Senevirathna took us on the amazing frog tour behind St. Andrew’s. The students were extra enthusiastic and we were able to see all of the six highlighted endemic species. This has become a real highlight of the highlands WWW experience, something that has been written up in Ishanda’s newly published book The Peeping Frogs of Nuwara Eliya. Pseudophilautus alto at St. Andrews/Pidurutalagala. Calotes nigrilabris at the summit of Pidurutalagala. Calotes nigrilabris baby at the summit of Kirigalpotta. Frog poster at Jetwings St. Andrew’s wetlands. Pied Thrush (Geokichla wardii) a rare winter visitor to Sri Lanka. Photographed at Nuwara Eliya’s Victoria Park feeding on a Mahonia leschenaultia tree that is endemic to the Western Ghats (and apparently not Sri Lanka). Creatures of the night in the Pidurutalagala forests edges. 2018 Highlands group on Totupola Kanda (2,360m) with view to Ambawella, Pidurutalagala and the north behind them. The Horton Plains area as seen with a Planet Dove 3m multi-spectral satellite. Imagery acquired soon after our visit and then processed by the author to emphasize vegetation and land use patterns. Amy accompanies a Dhonavur sister on a walk through the community campus. In a few weeks the Dhonavur Fellowship will celebrate 100 years of Naraikadu-the grey forest in the southernmost Western Ghats that they have been the guardians of for the last century. I have had the privilege of being their guest and visiting Naraikadu with Dhonavur communities on several occasions. This week to help mark the event and acknowledge the unique conservation effort by non-state actors and citizens working with the Forest Department I have contributed a short photo-essay and narrative on Naraikadu in Frontline, the respected newsmagazine of the Hindu newspaper group. The association that I have with Naraikadu is very personal. Over the last 25 years I have been fortunate to make several visits to Dhonavur, Naraikadu and parts of the Kalakad Mundanthurai Tiger Reserve (KMTR) with my friends in the community. I first wrote to David Rajamanian in 1995 about visiting. Through his sons Jerry and Ezekiel and their families I got to know the area and its history and made my first visits to Naraikadu. We have taken unforgettable journeys into the area, notably two epic journeys to Pothigai (Agasthyamalai) in 2002 and we are planning further forays into this little understood area of the Western Ghats. I have also had a chance to take several members of my family there including my wife Raina who fell in love with Nariakadu after cursing me on the hike up (with good reason-she was carrying 1.5 year old Lenny on her back). When our daughter Amy Zopari was born 11 years ago we named her in honor of Amy Carmichael in recognition for her remarkable personality and dedication to the wilderness area of Naraikadu. Earlier this year, during our April Sinhala and Tamil New Year break, Amy accompanied me on a week-long adventure to Kodai, Dhonavur and Naraikadu. The season of heat had set in on southern India and the area was experiencing a severe drought. The highlight was a three-day hike to Naraikadu. It was this visit and the experience of taking Amy back (she had visited on two prior occasions) that set in motion the conversations that led to the article being written. You can read the full article on Frontline’s website. The photo essay in the Frontline article utilizes a variety of evolving camera technology: there are 6×6 black & white film and digital SLR pictures but most of the key images were taken on a phone. I created two maps of the area for the article. The first shows elevation and utilizes high resolution digital elevation models and Swiss shade tints in ArcGIS. There was too much information in it for the article so I simplified it. The first map is included here. The physical geography of the area plays an important part in the story of Narikadu. To understand the southernmost Western Ghats one needs to appreciate the diversity of geography and consequently ecosystem diversity that exists in a relatively small area. The Tirunelveli plains are flat and separated from the wet western coast of Kerala by the rugged Ashambu ranges of the Western Ghats. Ganesh, T. et al. Treasures on Tiger Tracks: A Bilingual Nature Guide to Kalakad Mundanthurai Tiger Reserve. Bangalore, ATREE 2009. Print. Web Link. Gazetteer of the Tinnevelly District. Madras 1917. Web. Johnsingh, A.J.T. “The Kalakad–Mundanthurai Tiger Reserve: A global heritage of biological diversity.” Current Science. February 2001. Web. Johnsingh, A.J.T. Walking the Western Ghats. Mumbai: BNHS & Oxford, 2015. Print. Lockwood, Ian. “Kanyakumari and the Ashumbas in the South West Monsoon (Part 1)” July 2010. Web. Lockwood, Ian. “Kanyakumari and the Ashumbas in the South West Monsoon (Part 2)” July 2010. Web. 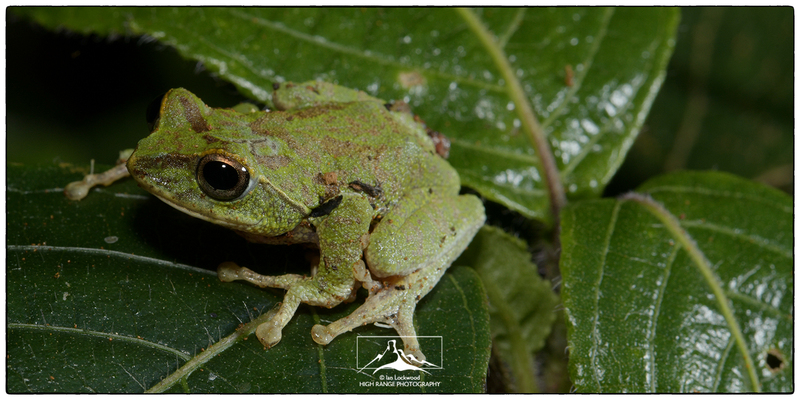 Male dull green shrub frog (Pseudophilautus viridis) in cloud forest above Nuwara Eliya. Sri Lanka’s Central Highlands have been recognized for their significant biodiversity. The area is a UNESCO-designated World Heritage Site yet (adopted in 2010) and there is a growing awareness about its unique flora and fauna. The Highlands are composed of the mountainous region at the heart of the southern island and include significant areas such as Peak Wilderness, Horton Plains National Park, the Pidurutalagala forests, the Knuckles protected area and several smaller tracts of forest. Most of the Central Highlands have largely been cleared of original vegetation in support of the plantation (mainly tea) industry. This happened during the 19th and early 20th centuries during colonial rule though recent decades have seen loss of forest to hydroelectric dams, plantations expansion and other human land uses. Today the remaining protected areas may be a small percentage of the total area, but they are well protected and offer the opportunity to experience some of Sri Lanka’s unique biodiversity. Collage of low res snapshots taken of life forms and waste on the trail to Sri Pada during the DP1 ES&S field study there in December 2015. The elusive Pied Thrush (Geokichla wardii), one of the most difficult birds to see in Sri Lanka. Male above and female in the inset image. Spotted at Nuwara Eliya’s Victoria Park during the Week Without Walls with the expert guidance of Ishanda Senevirathna, the naturalist at Jetwings’ St. Andrew’s Hotel. Calotes nigrilabris, the black-lipped lizard, basking in the sun just off the precipitous slope of Kirglpotta’s summit. 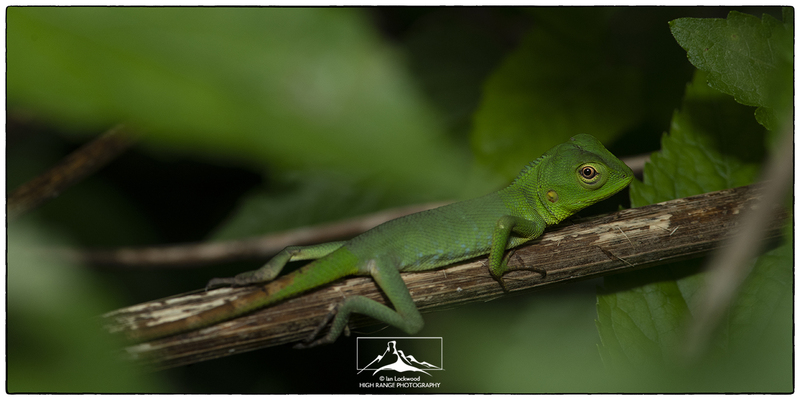 This agamid (dragon) species is endemic to the Central Highlands of Sri Lanka. A study of Pseudophillauts viridis, a rare endemic shrub frog from Sri Lanka’s cloud forest. All females except the bright green male in the upper right. Identification courtesy of Ishanda Senevirathna of St. Andrew’s. Kamilla found the male that is photographed here and the MYP5 students helped with holding lights. Several different shrub frogs including Pseudophillauts schmarda and others (to be updated shortly) from the Nuwara Eliya nocturnal frog walk. The Rhino Horned Lizard (Ceratophora stoddartii), an endemic cloud forest species from Sri Lanka’s Central Highlands. 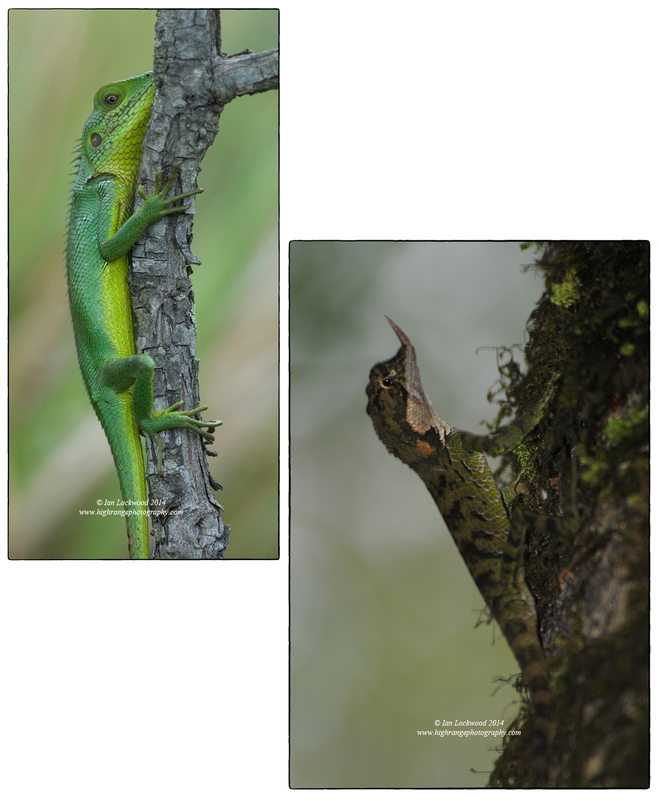 This female (top image) and male (middle and lower image) were photographed in Horton Plains National Park where their populations are stable, though not always easily seen. Class of 2017 stopping at the clearing on their way up to the summit of Sri Pada. We had clear views of the peak and surrounding forest all the way up to the temple at the summit. Back row: Carolyn, Brittany, Ahnaf, Sanoj, Shenali & Erika. Front row: Ian, Ariana and Jamaal. Photograph by Abbi Pilapitiya. Sunrise over Totopula Kanda (2,360m) Sri Lanka’s 3rd highest peak. Kirigalpotta (far left) as seen at sunrise from near to Mahaeliya. Horton Plains National Park in Sri Lanka’s Central Highlands is a unique high elevation ecosystem with intriguing parallels to the uplands of India’s southern Western Ghats. I was reminded of its mazing biodiversity and similarities with the shola/grasslands systems of the Western Ghats on a recent visit with my daughter Amy and friends Britton & Tracy. Our aim was to visit the plains, climb Kirigalpotta, stay in Department of Wildlife and Conservation (DWC) quarters, and assess the suitability of the place for a future OSC Week Without Walls experiential learning visit. Kirigalpotta is Sri Lanka’s 2nd highest peak at 2,390 meters. Given that there is a military radar station on Pidurutalagala, Sri Lanka’s highest peak (2,524m) and it is out of bounds, Kirigalpotta offers the next best opportunity to get seriously high in Sri Lanka! The table land of Horton Plains is already at almost 2,100 meters so there is not much of an elevation gain as you do the Kirigalpotta hike but it offers an unparalleled experience in walking though relatively undisturbed cloud forest and patanas (grasslands). Since my first visit to Sri Lanka as an adult I have been drawn to the Central Highlands for their montane landscapes, unique biodiversity and similarities to the higher ranges of the southern Western Ghats. In 2010 the Central Highlands were recognized as one of UNESCO’s World Heritage sites. Now after nearly a decade here I have had the opportunity to visit Horton Plains on a number of personal visits with friends and family. This school year I am getting ready to introduce a new Week Without Walls learning experience that will highlight the geography and ecology of the Central Highlands. Horton Plains and its peaks will feature largely in the planned experience. 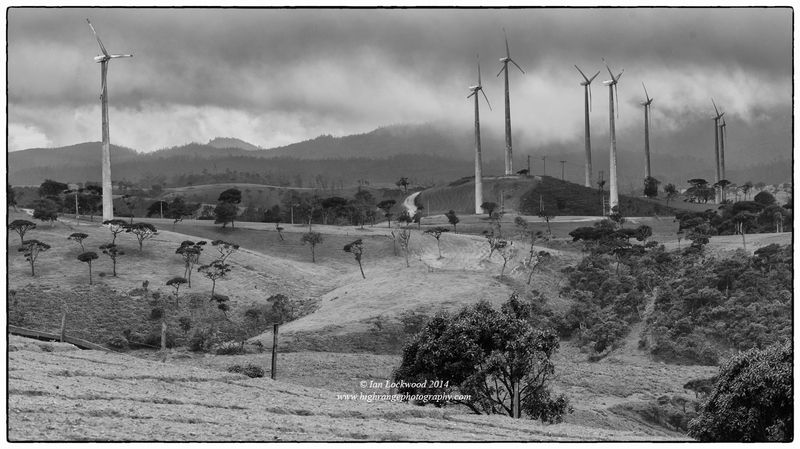 Looking north at newly installed wind turbines at the Ambawella farms with Horton Plains rising into the mist in the background. The turbines were not in place when I last visited and made a long panoramic images that was featured in the Si Pada: Paths to the Peak exhibition. 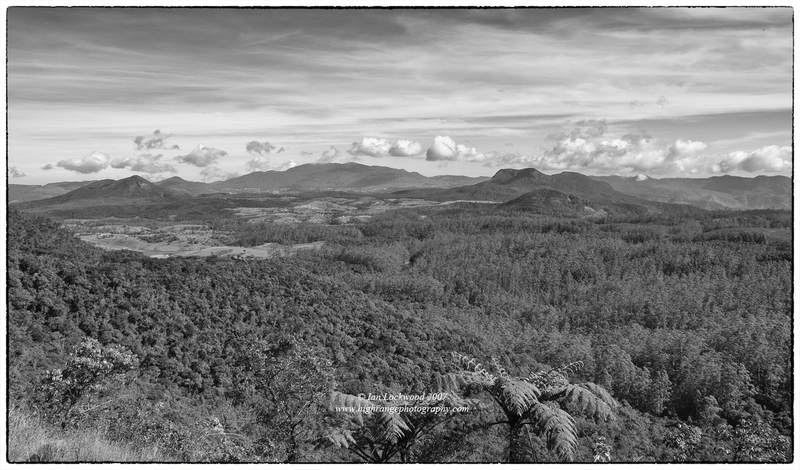 Looking north to Pidurutalagala (center left) and Hakgala (right) as seen from the road up to Horton Plains National Park. Taken on the November 2007 trip. Most people visiting HPNP-and there are a lot of them on weekends-make the long journey up to the Plains in order to do the leisurely World End trail. We had booked into the Maheliya bungalow through the DWC and were able to wake up in the Plains and head to the trail before the van loads and buses arrived. The Kirigalpotta trail starts at the same museum and parking lot (once known as Farr Inn) that is at the center of HPNP. There is a sign (see pictures below) and it leads off down the hill and along several long stretches of marshy patanas in a south-westerly direction. The path is well worn and on this trip we walked it without a guide. The patanas are intriguing with their different grasses, dwarf bamboo (Arundinaria densifolia) and scattered Rhododendron arboreum trees. Unlike in the south Indian highlands the cloud forest is on ridgelines and the patanas (grasslands) are in the valleys. I had made a memorable trip here with colleagues Ray Lewis and Dan Snyder and on that first trip it had been helpful to have a guide. The path crosses a tributary of the Belihul Oya and after some exquisite patana walking you dip in and out of the cloud forest. There had been a major flowering of the Strobilanthes in the understory a year ago (something I regrettably missed –see the Sunday Observer and Sunday Times) and on this visit the forest floor was covered in their dried out, woody detritus. The trail is at times rather muddy and Tracy and Britton took turns handing Amy across or just carrying her through these obstructions. After about a leisurely two hours the bath crosses a small rivulet and then makes the final climb up to the ridge and summit of Kirigalpotta. On the final stretch it follows the exposed ridge amongst mossy rock faces and stunted, dwarf trees and shrubs. We experienced a mix of sun and brief showers as we made the climb. On the Kirigalpotta ridge we got a brief view looking back towards the plains and Totopula Kanda (see panoramic images below). Amy zipped along with the careful attention of Tracy shadowing her as they negotiated the slippery ridgeline. The summit is composed of a small clearing in dense vegetation and a window over the western edge. On a boulder there are barely discernable markings of the Survey Department, left from their 19th Century survey of Ceylon. The serenity and natural state is a reminder of what the summit of Sri Pada probably once looked like. We enjoyed a quick snack, took a few snap shots and then decided to head back as clouds rolled in and brought with them rain. Snapshots in silver, black & white from the hike up to Kirigalpotta peak. The center image features a Vaccinium sp, with its distinct maroon/red bark. A similar example featured in my September 2011 post on Secret Shola in the Palani Hills. Looking north from Kirigalpotta over the cloud forest and patanas of Horton Plains National Park. Left: Calotes nilgilabris on a Rhododendron arboreum tree in open grasslands on the Kirigalpotta trail. Right: Rhino horned lizard (Cerathopora stoddartii) found in HPNP but photographed in Hakgala sanctuary. Rhododendron arboreum is a unique temperate species with links to the Western Ghats and more distant Himalaya. 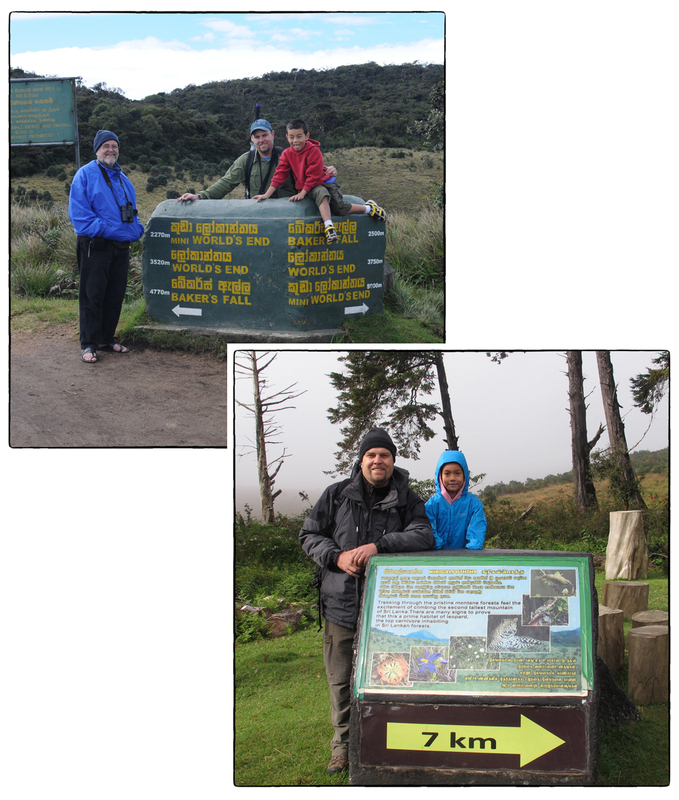 Three generations of Lanka Lockwoods visiting Horton Plains National Park. Upper left: Merrick (in his inimitable chapals), Ian and Lenny in December 2010 at the World End trail head. Lower right: Ian and Amy in September 2014 at the Kirigalpotha trail head. Photos courtesy Brian Lockwood and Tracy Ramberg. 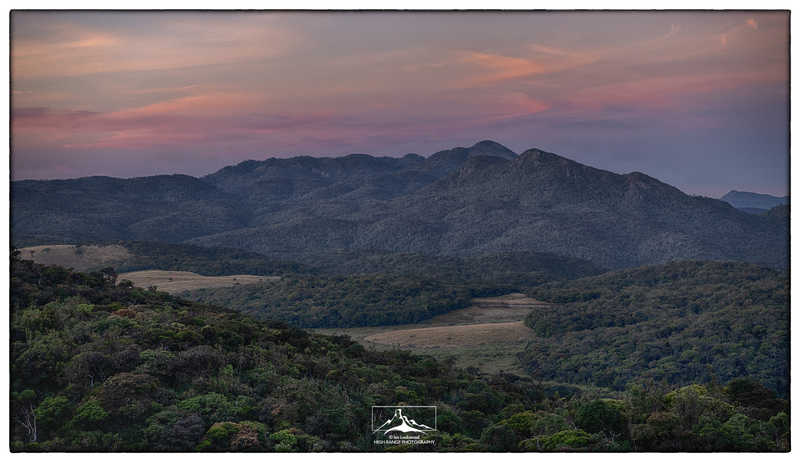 A parting sunrise over Horton Plains National Park. Taken near Mahaeliya. In 2012 Rohan Pethiyagoda of the Wildlife Heritage Trust published the seminal book Horton Plains: Sri Lanka’s Cloud Forest National Park. It is an exquisite publication both in production and the sweeping content that examines ecological, historical and contemporary aspects of the park. While Rohan is the editor and force behind the book Horton Plains includes articles and contributions by the leading natural history personalities in Sri Lanka. The book is supported with a dazzling wealth of color photographs, line drawing, aerial shots and high-resolution satellite (IKONOS) images of the Plains. The fine photography of Vimukthi Weeratunga is featured and stands out in the book. The book has intriguing chapters on the history of the Plains and articles on the ecological origins of the patanas (an anthropocentric-influenced system or a climax natural system?….you’ll have to read the book to see what conclusion is arrived at!). For anyone interested in the ecology and landscape of the Central Highlands and their similar systems in the southern Western Ghats in India, the book is a must have resource. De Silva, Anslem. The Diversity of Horton Plains National Park. Colombo: Vijitha Yapa Publications, 2007. Colombo. Print. Lockwood, Ian. “In the High Altitude Grasslands of Horton Plains.” Ian Lockwood Blog. 28 February 2011. Web. Pethiyagoda, Rohan, Ed. Horton Plains: Sri Lanka’s Cloud Forest National Park. Colombo: WHT, 2012. Print. Weblink. Rodrigo, Malaka. “Lanka’s central highlands win heritage battle.” 8 August Sunday Times. 2010. Web. Werner, Wolfgang. Sri Lanka’s Magnificent Cloud Forests. Colombo: WHT, 2001. Print. NOTE: With regards to spelling you will see “Kirigalpotta” spelt in several different ways. I have used the spelling from the Wildlife Heritage Trust’s publications. 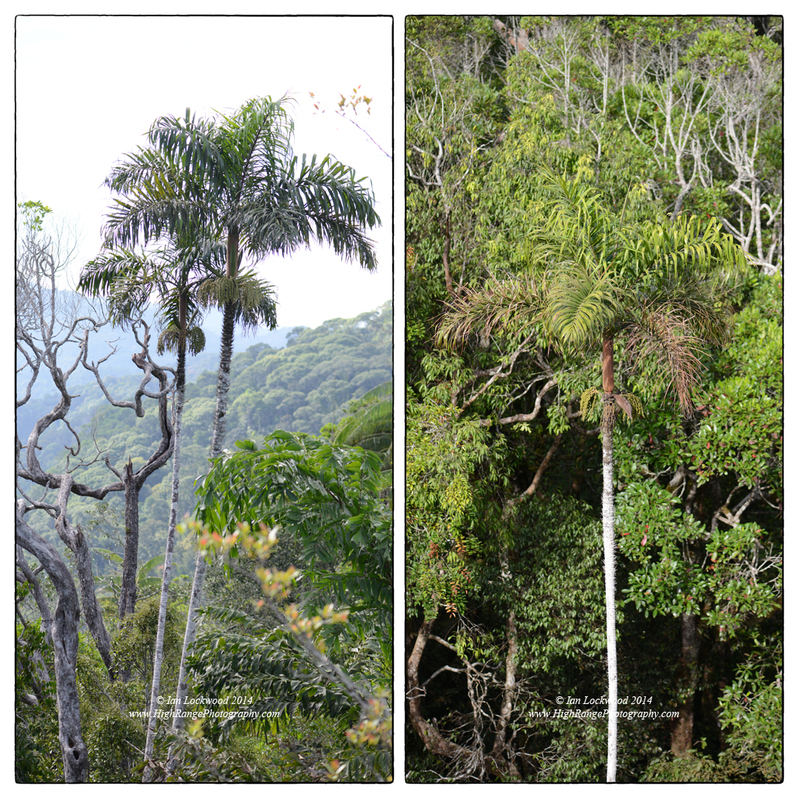 Images from Sinharaja rainforest and its edges: emergent layer on Moulawella, misty primary forest, mixed cultivation on the north-west edge of the protected area. Last week OSC’s DP Geography class spent four productive and memorable days in Sinharaja rainforest collecting data for their internal assessment. 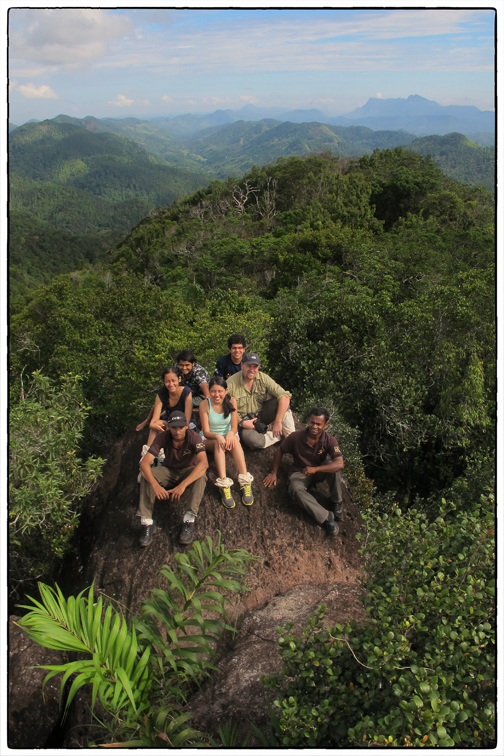 This is the 10th OSC class to visit Sri Lanka’s well known tropical rainforest. Located in the south western Rukwana Hills, Sinharaja is a designated UNESCO biodiversity heritage site and has received widespread recognition for its flora and fauna. A key aspect of its story is the remarkable recovery that the forest has made after being heavily logged in the early 1970s. Today Sinharaja offers a model site to study ecotourism, rainforest ecology and rural home garden agriculture. Our trip provided an opportunity for students to collect field data for their internal assessment, a 2,500 word research paper that accounts for 20-25% of their final grade. As we have done on past field studies, this year’s cohort focused on themes of tourism, biodiversity, energy, land use and home garden agriculture. Once again, we stayed at Martin Wijeysinghe’s Jungle Lodge. This small guest house has ideal conditions for a forest experience and field study. It sits on the boundary between the buffer and core zone of the protected area and there is easy access to several different habitats. There is excellent secondary forest that attracts most of the endemic birds and a clear stream for guests to cool off in. Electricity is generated by a small micro-turbine, water is heated by solar panels and the food is locally produced. There is very limited cell phone connectivity, something that delights old fashioned teachers but can challenge students used to 24/7 connectivity. Weather conditions were wet during our stay, but the showers came in the afternoon and we had productive mornings in the surrounding landscapes. This year’s Geography cohort was its smallest in recent memory, with only five students participating. We were supported by Ms. Uthpala De Silva, who assists the secondary school with cover work. She was an enthusiastic participant and was particularly resourceful in helping with translation and building bridges with community members who the students were interviewing. After getting settled into Martin’s on Tuesday afternoon we started the experience with an introductory walk to the Sinharaja core area. That afternoon we traversed the well-worn tourist paths though secondary, and primary forests. Different types of Geographic data being gathered by OSC DP students in Sinharaja. 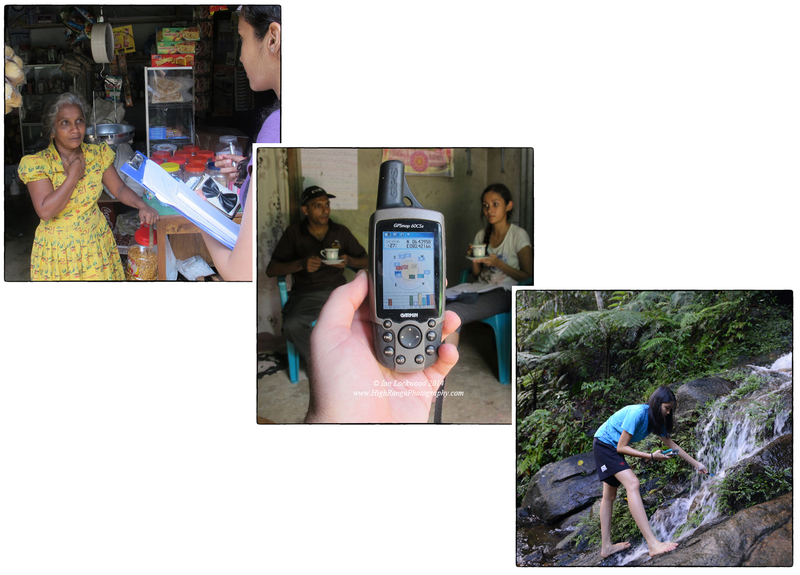 Socio-economic data from Kudawa residents, spatial data in a household and water quality data from a forest stream. Over the next two days students broke into two small groups to gather field data on their individual geographic questions. This year most students had questions that involved the home gardens and human-dominated landscapes on the park boundary. Sajni looked at soil conditions in forest and human-impacted landscapes. Mikka studied water quality and land use. Jitmi researched energy consumption patterns to devise a measure of people’s ecological footprint. Nikita assessed bird diversity to inform his question on differences in land use and habitat. Finally, Ravin looked at tourist numbers and attitudes of local residents towards the increasing importance of tourism as a strategy to improve livelihoods in the area. A highlight was building relationships through our guides with the Kudawa community. Most of these people make a living growing tea and other crops on small parcels of land (home gardens). For several men and women, guiding tourists provides an important secondary source of income. 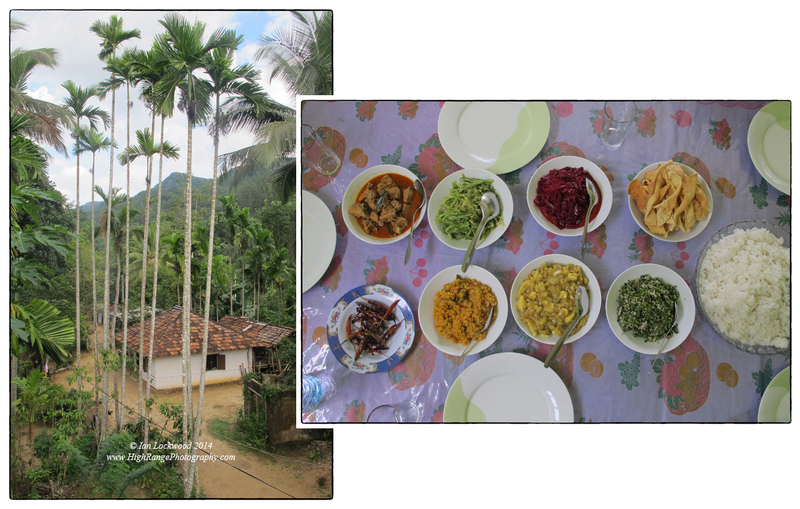 We explored remote home garden pockets to gather data and enjoyed several traditional village meals. Jackfruit curry, gotukola sambol and a special forest mushroom curry were gastronomical highlights. 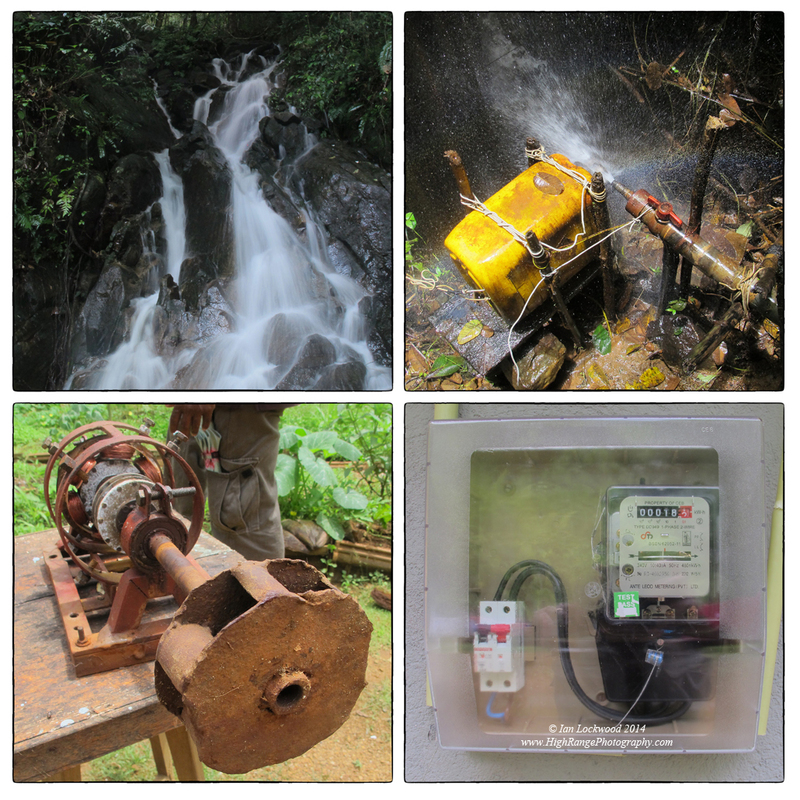 Stages in generating micro hydroelectricity in Sinharaja. The examples here are simple alternators hooked up to pipes in the forest but there are other more powerful generators set up with funds from the ADB and other donors. Entrepreneurs can now sell electricity back to the CEB since the area is being hooked up to the gird. A typical home garden scene in rural Sri Lanka. This is the Kudawa home of Chandra, Sinharaja’s first female nature guide. It is overshadowed by the forests of Sinharaja (and Moulawella peak). The food image shows the scrumptious traditional lunch prepared by Martin’s daughter in Kudawa. In order to get the data gathered all groups had to do a fair amount of walking in sunny, humid conditions. There were significant physical demands as streams were forged, jungles traversed and mountains climbed in search of data. Leeches were discouraged with the famous Sinharaja leech socks and various liquid deterrents. Students and their teachers suffered little more than a few small itchy bites. The afternoon showers helped moderate the climate and on Thursday afternoon there was time to cool off in the stream near Martin’s. On the final morning we took a fast-paced trek up to Moulawella Peak (fondly renamed “cell phone mountain” by Ravin for its clear G3 reception). Here, on a clear, rain-washed morning we appreciated the landscape taking note of vast areas of protected rainforest as well as the patchwork of tea gardens, pine plantations and other landscapes to the north and west. We returned to Colombo on May 2nd with ample field data and experiences not to be forgotten. The class is now working to process and analyze the data, while using the school’s GIS software to provide original maps of the study site. Katu Kitul Palm (Oncosperma fasciculatum), a favorite highland palm for elephants who can get to them. Photographed on the steep slopes of Moulawella peak. 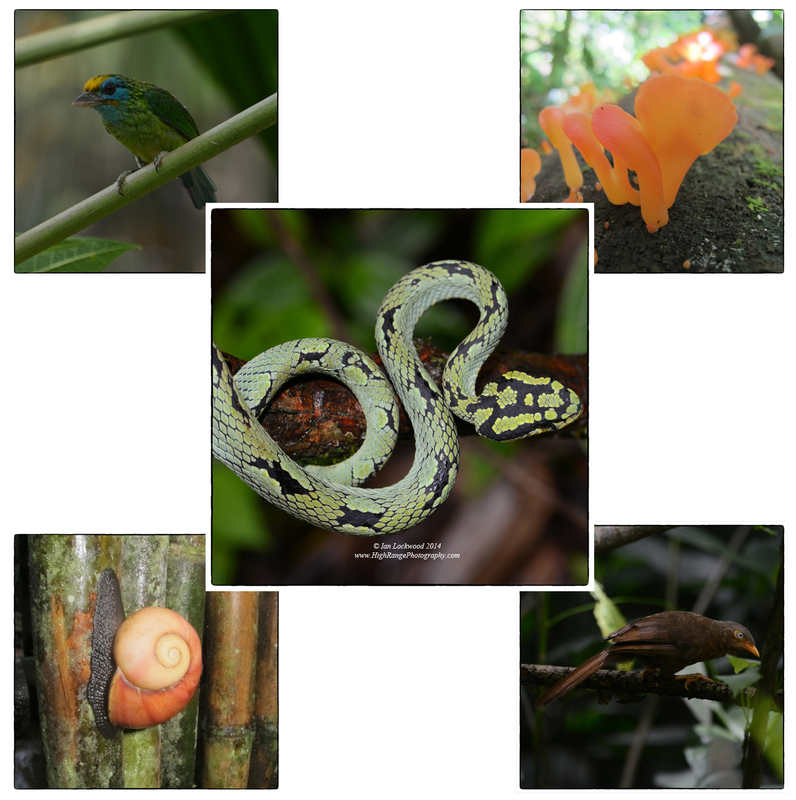 Selected biodiversity from a short trip to Sinharaja: Clockwise from upper left: Yellow-Fronted Barbet (Megalaima rubricapillus), fungi in secondary forest, Orange-Billed Babbler (Turdoides rufescens), large land snail, Sri Lanka Green Pit Viper (Trimeresurus trigonacephalus). Looking south from Moulawella on a clear morning on our last day. This is a composite of four images taken with a Nikon D-800, thus producing a very, very large image. 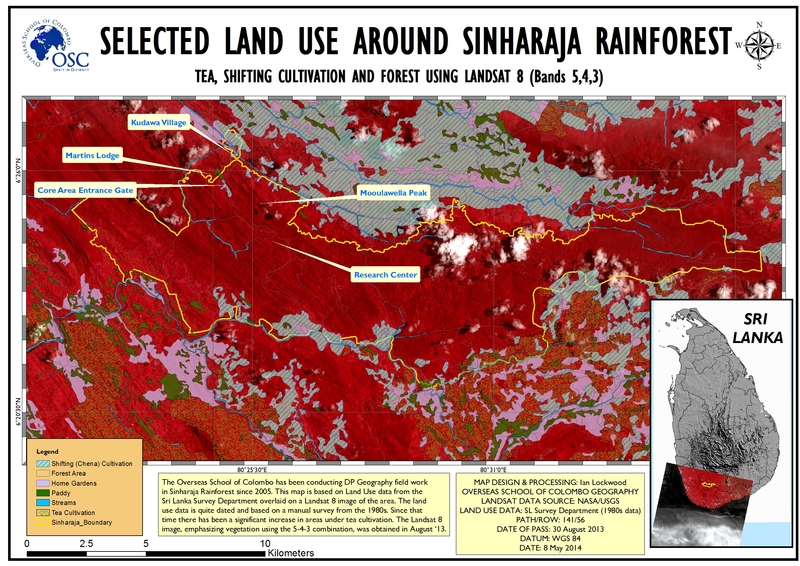 It has been reduced for this format but clicking on the image should give a better sense for the vast protected area in Sinharaja’s heart. OSC Class of 2015 DP Geography group on Moulawella peak with their teacher and guides (Ponaiya & Gunaratna). It was a remarkably clear day with uninterrupted views of Sri Pada. Picture courtesy of Uthpala De Silva. Looking north from Moulawella’s 760 meter peak to the Central Highlands. Sri Pada or Adam’s Peak (2,243 meters) is a point on the distant, blue ridge to the right of the center. This image has also been cropped and reduced but it was clear to Horton Plains and beyond. 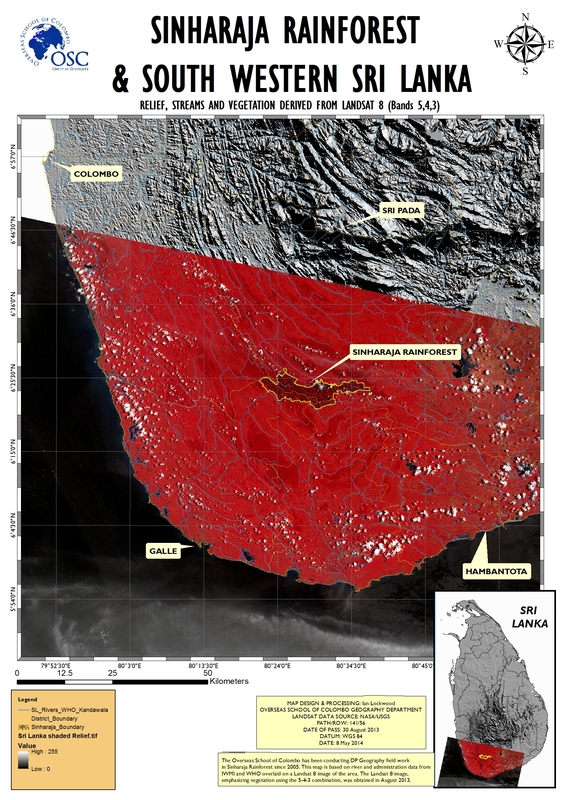 2014 Sinharaja Study Area (click on image for full 150 DPI A3 version). Sinharaja rainforest has been host to a number of significant scientific studies in the decades since logging operations ceased in 1977. Several landmark ecological studies have been conducted over the last four decades. This includes the two-decade long forest dynamics study of a 25-hectare plot by the Smithsonian Tropical Research Institute , Peradeniya University and several other notable institutions. A classic study on the composition and spatial organization of mixed species flocks by Sarath Kotagama and Eben Goodale from 2004 serves as a model study and journal article for OSC students. An intriguing development in the western corner of Sinharaja is how it is being used as a location to host “reconciliation workshops” for students from all over the country. The basic idea is to bring teenage students from government schools in the conflict affected areas in the north and east of the country and foster an appreciation of nature to help provide a more lasting peace. “Reconciliation through the Power of Nature” is facilitated by the tireless work and enlightened thinking of Professor Kotagama and the Field Ornithology Group of Sri Lanka (FOGSL) with support provided by Dilmah Conservation. Martin hosts these student-teacher groups at his lodge and there are illuminating posters illustrating the goals and outcomes of the three day workshops for Jaffna schools. Abeywickrama. Asanga, Sinharaja Rainforest Sri Lanka. Web. 2009. DeZoysa, Neela and Rhyana Raheem. Sinharaja: A Rainforest in Sri Lanka. Colombo: March for Conservation, 1990. Print. Gunatilleke, C.V.S, et al. Ecology of Sinharaja Rain Forest and the Forest Dynamics Plot in Sri Lanka’s Natural World Heritage Site.Colombo: WHT Publications, 2004. Print. Harrison, John. A Field Guide to the Birds of Sri Lanka. UK: Oxford University Press, 1999. Print. Kotagama, Sarath W and Eben Goodale. “The composition and spatial organization of mixed-species flocks in a Sri Lankan rainforest.” Forktail. 2004. Print. Lockwood, Ian. “Into the Wet: Field Notes From Sri Lanka’s Wet Zone.” Sanctuary Asia. August/September 2007. 3-11. Print. PDF. Lockwood, Ian. “Montane Biodiversity in the Land of Serendipity.” Sanctuary Asia. July 2010. Print. Sri Lanka Survey Department. Sheets 80 & 81 (1:50,000). Colombo: 1994. Maps & Spatial Data. Warakagoda. Deepal et. al. Birds of Sri Lanka (Helm Field Guides). London: Helms Guides, 2012. Print. Wijeyeratne, Gehan de Silva. Sri Lankan Wildlife (Bradt Guides). Bucks, England: Bradt Travel Ltd. 2007.Print. Vigallon, S. The Sinharaja Guidebook for Eco-Tourists. Colombo: Stamford Lake Publications, 2007. Print. A Map showing Sinharaja in relationship the surrounding area. This utilizes the same Landsat 8 image from the land use map above.